The 2018 Audi Q7 offers a dynamic performance and intuitive technology for passengers to enjoy, along with plenty of safety features to give drivers confidence behind the wheel. The Audi Q7 includes a Singleframe® grille and available full LED headlights to create a bold front fascia that gives off an aggressively sporty appearance. The athletic stance and chiseled body lines complete the look of the Q7, making it sure to turn heads down any road. Inside the Audi Q7, lavish creature comforts and innovative features are woven into every detail of the design. Available 4-zone automatic climate control gives you and your passengers more customization over your temperature preferences, and an available panoramic sunroof with power sunshade keeps the cabin of the Q7 feeling bright and open, adding to its spacious feel. The rear seats in the Q7 have a split-folding feature so that you can create any combination of passenger and cargo space that you need. The Q7 offers up to 71.6 cubic feet of cargo area and 35/30/35 and 50/50 split-folding rear seats. The Audi Q7 is a powerful, capable SUV, coming standard with Quattro® all-wheel drive. This system enables you to drive at higher levels of precision and handling by using active torque distribution to the rear axle and increased stability when cornering. The Audi Q7 has an available 3.0-liter TFSI® engine that is capable of producing 333 horsepower and 325 pound-feet of torque. Pairing this engine with an eight-speed Tiptronic® automatic transmission gives you fast and smooth shifting and a dynamic driving experience overall. Technology in the Audi Q7 is intuitive and advanced. An available virtual cockpit includes a fully digital 12.3-inch display screen that shows you all of the pertinent information you need to drive, including navigation, audio, as well as Google Earth™. MMI® all-in-touch with handwriting-recognition technology gives you more control over your options on the touchscreen display by allowing you to write in your command instead of selecting letters or numbers individually. 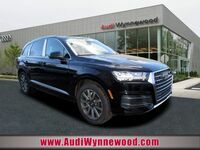 The 2018 Audi Q7 is available now at Audi Wynnewood. Browse our inventory and set up a test drive online today! 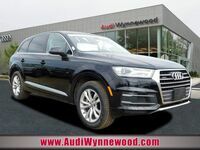 Interested in a Audi Q7?